The ETS 9-round 9mm magazine extends slightly outside of the magazine well. 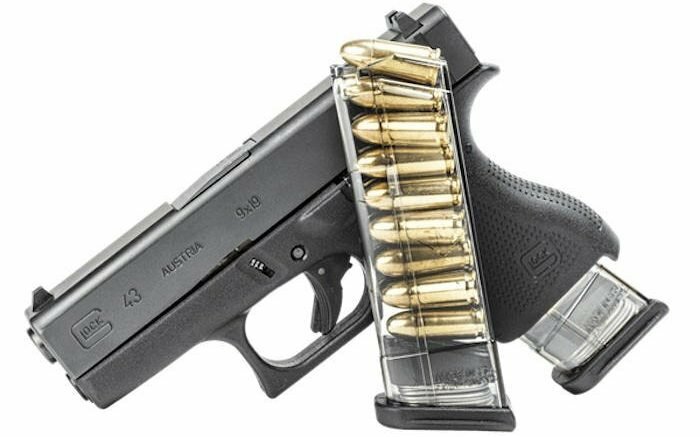 Like all Elite Tactical Systems (ETS) Glock magazines, the new models for the Glock 42 and Glock 43 are made with extreme impact-resistance advanced polymer materials. 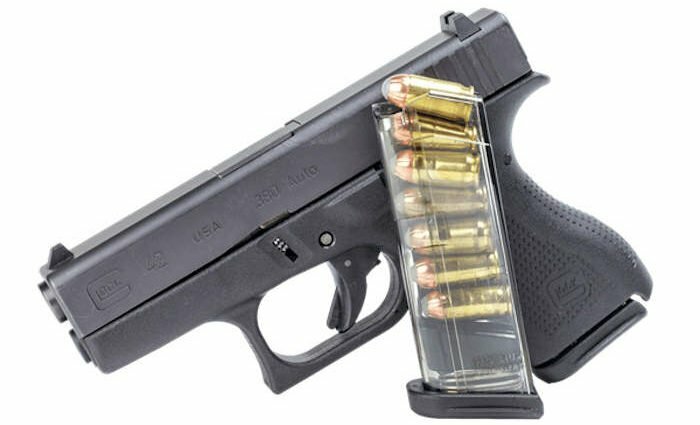 ETS claims their advanced polymer construction will not crack or break when dropped, despite its stiffer overall composition from the softer polymer Glock OEM magazines. During our own shooting experiences we ejected empty (and some full) ETS magazines onto a concrete range floor to test out the claims from ETS. The magazines sustained several drops from a height of 4-5 feet, and continued to function flawlessly. During one range session I did notice a slight scuff mark on the edge of one of the magazine’s front edges at the open-ended top where cartridges sit ready for loading. The scuff was noticeable, but did not appear to be a crack and did not impede future shooting in any manner. ETS translucent polymer provides outstanding visual reference for load and capacity (.380 option shown). ETS magazines are made with translucent polymer, allowing the shooter to make a fast confirmation on ammunition type and capacity. This can be very beneficial in a self-defense shooting situation, and provides much greater visual confirmation than simple small dots found on the back of Glock factory magazines. The ETS Glock magazines have a slick siding that helps eject magazines smoothly. 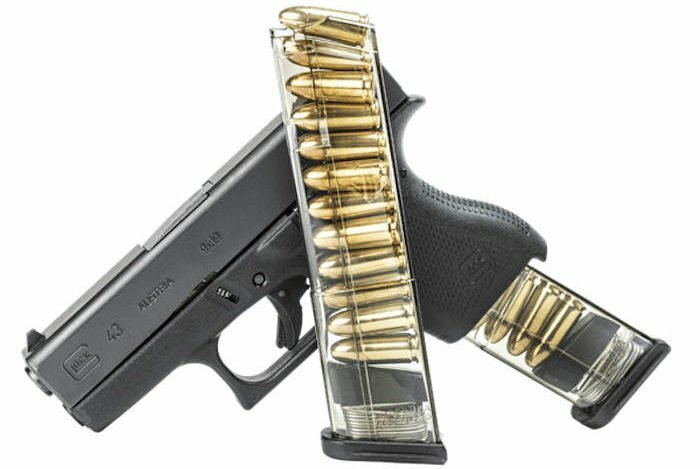 Glock factory magazines, with their softer polymer construction, tend to get a little sticky with use. This combination tends to require additional effort to eject magazines, beyond simply pressing the magazine release lever. During our own experiences we found the ETS magazines would sometimes fall completely free with simply a magazine release lever press. This is highly advantageous in rapid reload situations, such as self-defense shooting or even competition shooting. Around half of the time the ETS magazines required some assistance in ejecting from the magazine well. This could be accomplished from the wrist-flick technique or by off-hand manual removal. The ETS floorplates have a grooved side providing additional tactile grip to assist with this technique. The ETS Glock-style floorplates include a horizontal groove to give extra tactile gripping for extraction. The ETS magazines do have their own follower. Similar to the Glock there are some slight differences, likely required by patent or trademark protections. As mentioned, our experience with ETS magazines has not produced any concerns about the functionality of the magazines, including proper feeding. Should the shooter desire to switch out the follower, the ETS magazines break down just like Glock OEM magazines, and the switch out could take place in minutes. In fact, the floorplates are easily interchangeable as well. Designed for feed lip creep resistance, allowing mags to be stored fully loaded. The ETS 7-round magazines in both .380 caliber and 9mm, provide the shooter with 1+ capacity over Glock’s own factory magazines. This is accomplished while still maintaining a flush fit in the magazine well. This may not seem like much, but many CCW shooters carrying limited capacity firearms are more than happy to invest in one extra round. 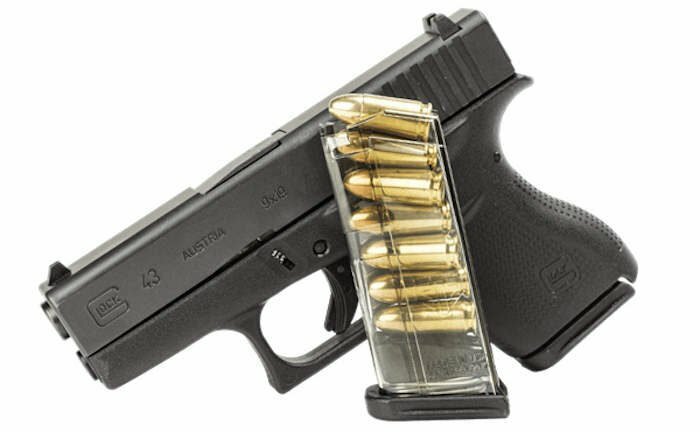 Adding 1+ capacity to the flush-fitting 7-round magazine is a great benefit over Glock OEM magazines. 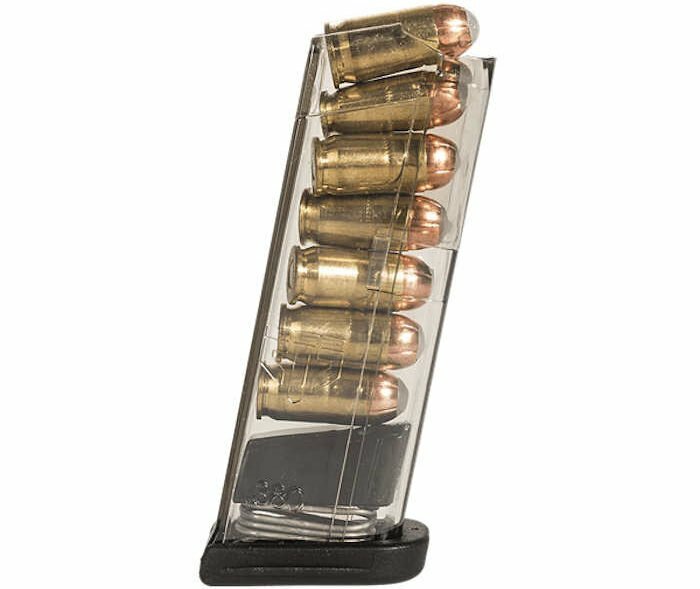 ETS 12-round magazines extend noticeably from the magazine well, but offer the highest capacity. The BlueSheepdog Crew are always very cautious about firearms accessories that have direct input into the operability of the firearm. This includes magazines such as the ETS Glock magazines. However, we are aware of the tremendous financial benefit of after-market magazines when compared to typically expensive OEM magazines. The balance of quality and dependability versus price and availability is not one to take lightly. From our experiences with ETS magazines we have found them to be well-made, durable, and to function flawlessly in our limited experience (approximately 500 rounds through several different ETS magazines). This experience has involved multiple reloads, rapid follow-up shots, and ejections of the magazines onto concrete floors. So far (other than the above noted scuff mark) the ETS magazines have endured the treatment very well. However, it would be hard to fully support the use of ETS magazines as primary duty magazines at this time. For a variety of reasons I believe factory Glock magazines should be used as primary duty magazines. With that in mind, ETS magazines make a strong case for training, and perhaps even back-up or off-duty situations. This is especially true if an officer must supply magazines for this purpose on their own expense. We still highly recommend users to conduct their own familiarity and compatibility tests to ensure ETS magazines are a good fit for you and your Glock. Ets glock 43 mags. I have had issues with loading and the last round being super tight. Mags don’t always lock into the magwell without a lot of pressure. Also if you carry with one round in the chamber then it would fail to eject the first round. Thanks for the feedback Josh. I haven’t had the chance to use the 42 and 43 mags so this is very helpful to know. I have used mags for the Glock 22 and Glock 23, and so far had success. I did have similar tightness issues with the last round, but that worked out with more use. So far no ejection issues or FTF, FTE with the larger mags. I wonder if the single stack springs are the issue? I’ve had numerous issues with the 7 round .380 mag. The last round does not always load and it does not drop cleanly when itvruns dry. I’ve contacted the company via email and they never responded back. I will stick with standard Glock mags.